Designed to enhance the habit of children running a stick along a fence, the Melody Fence uses posts in four different metals at differing lengths, that when struck play a specially composed melody. This project was a collaboration with composer Bree van Reyk. 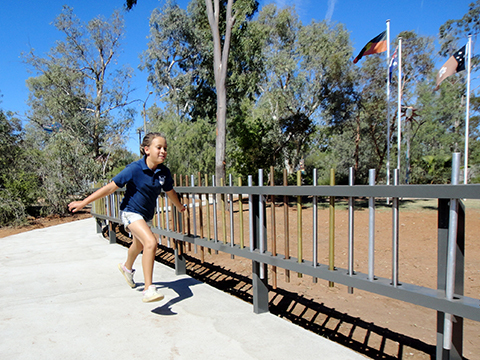 The Melody Fence was installed at Ross Park Primary School in Alice Springs in April 2012. 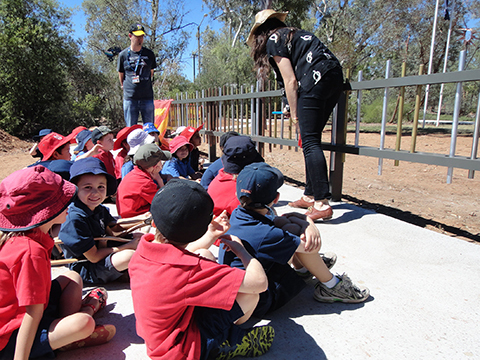 It runs along a main footpath entrance and is engaged with every school day by students entering or leaving the school grounds. Two week-long workshops were delivered by Bree and myself as part of the project. "I learnt it was a musical fence, ‘cause when I first saw it I thought it was a regular fence"
"I found out that you can actually play music with everything"
"I learnt that even kids can make something sound very nice"